1 Universidad de La Salle, Facultad de Veterinaria, Carrera 2 No. 10-70, Bogotá, Colombia. The objective of this work was to establish, under experimental laboratory conditions, a colony of Lucilia sericata, Bogotá-Colombia strain, to build life tables and evaluate two artifcial diets. This blowfy is frequently used in postmortem interval studies and in injury treatment. The parental adult insects collected in Bogotá were maintained in cages at 22°C±1 average temperature, 60%±5 relative humidity and 12 h photoperiodicity. The blowfies were fed on two artifcial diets that were evaluated over seven continuous generations. Reproductive and population parameters were assessed. The life cycle of the species was expressed in the number of days of the different stages: egg = 0.8±0.1, larvae I = 1.1±0.02, larvae II = 1.94±0.16, larvae III = 3.5±0.54, pupae = 6.55±0.47, male adult = 28.7±0.83 and female adult = 33.5±1.0. Total survival from egg stage to adult stage was 91.2% for diet 1, while for diet 2 this parameter was 40.5%. The lifetime reproductive output was 184.51±11.2 eggs per female. The population parameters, as well as the reproductive output of the blowfies that were assessed, showed relatively high values, giving evidence of the continuous increase of the strain over the different generations and making possible its maintenance as a stable colony that has lasted for more than two years. Key terms: Lucilia sericata - diet - fecundity - life cycle - life table. Lucilia sericata (Meigen, 1826) (Diptera: Calliphoridae) is a necrophagous fy that is important in forensic medicine because it is used as a biological indicator in estimating post-mortem interval (PMI) (Anderson, 2000; Tarone & Foran, 2008; Zurawski et al., 2009). It also has a signifcant role in human medicine because its larvae are used for healing chronic injuries that do not respond to conventional treatments, such as ulcers containing gangrenous or necrotic tissue (Church & Courtenay, 2002; Cartier & Combemale, 2008; Gupta, 2008). Additionally, in many parts of northern Europe this blowfy is characterized as a facultative ectoparasite responsible for primary cutaneous myiasis in sheep (Hall & Wall, 1995), with major economic impact (French et al., 1992). The species has been described as having a holarctic distribution and is also found in Australia (Smith 1986), but it could be found anywhere in the world. In the neotropical zone there are reports of its distribution in Colombia, Argentina, Brazil, Chile and Peru (Pape et al., 2004; Figueroa et al., 2007). In Colombia, its presence has been recorded in the Departments of Antioquia, Cundinamarca, Santander and Sucre (Pape et al., 2004). L. sericata is considered as a sinantropic species, i.e. it is in close relation with human settlements. Studies of the biological cycle of L. sericata have been conducted previously on samples taken from decaying corpses to determine the PMI (Kamal, 1958; Greenberg, 1991; Anderson, 2000; Grassberger & Reiter, 2001), and some works with this species have dealt with age structure, mortality rates and reproductive output in populations in northeast Europe using samples developed under field conditions (Wall, 1993; Smith & Wall, 1998; Hayes et al., 1999; Pitts & Wall, 2004). However, there has been less research on life tables and reproductive and population parameters carried out under laboratory conditions with samples of the species from a neotropical country like Colombia, in order to analyze average data from several consecutive generations, as was done in the present study. The life tables of a population are very important because they give the most comprehensive description of the growth, survival and fecundity of the blowflies (Abou-Zeid et al., 2003). A vertical life table is used to analyze survival or mortality in different stages of life (Southwood, 1978), while a horizontal life table is used to estimate reproductive and population parameters. Given the importance of L. sericata in human and veterinary medicine, deeper knowledge is needed of its life cycle, life tables and reproductive and population parameters, since this information can support the mass rearing of larvae under laboratory conditions to be used in larval therapy and can also contribute to control strategies of the blowfy population in nature. The food consumed by L. sericata under laboratory conditions is a key factor because it affects biological developmental and population dynamics. Natural diets such as beef liver that are often used in laboratory rearing of flies produce offensive odors and contamination (Sherman & My-Tien Tran, 1995). As well, it has recently been demonstrated that the presence of toxins in decomposing tissues from natural diets can alter the development rate and generate errors in PMI estimates when necrophagous insects are used for forensic studies in the laboratory (Estrada et al., 2009). Several artificial diets have been proposed and developed as alternatives for the maintenance and rearing of L. sericata (Tachibana & Numata, 2001). However, some of these diets may not meet the optimal nutritional requirements for nourishing specific strains of the species. Therefore, it is necessary to evaluate new diets and use life tables to analyze and understand the impact on growth, survival, reproduction, and population parameters. The main purpose of this work was to establish under laboratory conditions a colony of L. sericata, from samples of adult specimens collected in Bogotá, Colombia, to build life tables and to evaluate two artifcial diets. Sampling information - Adult L. sericata were collected at the San Martín meat processing plant in Bogotá, Colombia. Three-pound portions of pig liver were used as bait to attract the blowfies, which were carefully captured by using entomological nets and immediately stored in glass jars, and then transported in a polystyrene icebox to the laboratory of Medical and Forensic Entomology of the Universidad del Rosario. Insect collections were carried out for two weeks, conducted in the mornings for two the highest population densities of fies were observed in the early hours of the morning when the sunlight is less intense than the rest of the day. Collections of adult fies continued until a suffcient number of specimens for the colonization process had been captured. Maintenance of blowfies in the laboratory - The work was conducted between February 2006 and April 2007. The taxonomic identification of the material captured in feld was carried out by using the taxonomic keys of Carvalho & Ribeiro, (2000) and Mariluis & Peris, (1984). These keys were only applied to the identifcation of adult specimens. Adult forms of L. sericata were kept in 45x45x45cm Gerberg cages at 22°C±1 average temperature, 60-%±5 relative humidity and 12 h photoperiodicity, protected with an external tulle veil to avoid the entry of other insect species. There was a fask with a cotton pad soaked in a sugar solution in each cage to provide a carbohydrate source. On a daily basis cages, containers and other utensils proper to the colony were cleaned. Every 45 days the cages were washed with water and detergent and then sterilized in an autoclave. Diets and life cycle - Two artifcial diets were evaluated. Diet 1, designed and standardized at our laboratory, consisted of a mix of nutritious agar (4.6 g), ram blood (25 ml), powdered liver (6 g), BHI broth (4.2 g), sodium acid phosphate (0.012 g), potassium acid phosphate (0.012 g), sodium chloride (1.2 g), glucose (1.2 g) and distilled water (100 ml). Diet 2, proposed by Gingrich et al. (1971), modifed by Brown & Snow, (1979) and adapted by our group, consisted of blood four (9 g), egg four (6 g), powdered milk (6 g), agar (2.5 g) and water (100 ml). Both diets were prepared with prior sterilization of the solutions in a type II biological safety cabinet to avoid any type of contamination. Eggs of L. sericata were gathered daily from the nutritious substrate of each diet, counted, and then placed in glass jars with a new sterile nutritious substrate of the same diet, and covered with sterilized veils. The larvae that favorably hatched from the eggs and passed from one instar to another were counted and all were maintained under the same environmental conditions as the adult organisms. When the larvae reached the third instar they were transferred to wide-mouthed jars flled with sterilized sand where pupation occurred and the corresponding counting was carried out. Finally, when the adult fies emerged, males and females were registered and put together in cages for continuing the life cycle. Vertical life table and estimation of mortality -The vertical life table was developed from two independent cohorts of 30 female and 30 male virgin adults born on the same day. After a crossing period, the 30 parental females suitable for oviposition from the second to the seventh generation were used, both for diet 1 and diet 2, and placed in separate cages. The eggs on the substrate of each diet were collected and the daily counting of the different life cycle stages was performed in order to evaluate the effects of the two diets. Based on the vertical life table, mortality rates (Rabinovich, 1980) and survival curves were established. Horizontal life table and estimation of reproductive and population parameters - The horizontal life table was developed based on one cohort of 30 adult female fies born the same day and taken from the seventh generation; these were left for a period of five days with the males since this is the estimated time to start oviposition after having hatched from the pupae. The females were then individually placed in jars (30 jars with the diet that showed better results) where egg laying occurred. Eggs, laid by each fy until its death, were counted daily. Finally, the necropsy was carried out on the 30 females that completed the adult stage and died, in order to establish the number of eggs retained by them. Based on the horizontal life table, reproductive and population parameters such as fecundity, reproductive value (Vx), net rate of reproduction (Ro), mean generation time (Tc), innate ability of population increase (rc), intrinsic rate of population increase (r), finite rate of population increase (λ) and natural rate of population increase (rm) were calculated following the procedure described by Cárdenas et al., (1999). The construction of the horizontal life table was based on the methods of Pianka, (1998); Rabinovich, (1980), and Southwood, (1978). Statistical analysis - Descriptive statistical parameters were used for each stage of the blowfy's life cycle. A two-way ANOVA was used to compare the data obtained from the two diets. Likewise, Tukey and Scheffé tests were used to statisticallydetermine signifcant differences among stages of the fy's life cycle. The results were developed with the 14.0 version of the SPSS program. The data used for ANOVA and Tukey and Scheffé tests were generated from the vertical life table. Determination of life cycle of L. sericata - Life cycle duration of L. sericata was determined by taking this parameter based on diet 1, which resulted in a higher effciency over six consecutive generations (G2 to G7), and recording the average time both in days and hours, for the different stages in this species (Table I). Analysis stage-specifc mortality on both diets - Table II shows the results for both diets derived from the vertical life table, where ax is the result of the daily counting of the individuals observed in different life cycle stages for the species L. sericata and lx is a higher number of oviposition was 6.44±1.6 batches per female. The mean eggs laid per female were 184.51±11.2, with a maximum number of 199±16.3 and a minimum of 172.9±20.5. Finally, the total mean of eggs per female during the whole life span of L. sericata was 1190±45.9, with a maximum of 1592±63.8 and a minimum of 712±56.4. The reproductive value (Vx) of the females in the cohort at 27.5 days was 80.44 (Table III). The predictive population parameters were estimated in absence of mortality according to Southwood (1978). The following values were obtained from Table III: net reproductive rate Ro = 586.84 female offspring per cohort female; mean generation time Tc = 17.81 days; innate ability of population increase rc = 0.44 days; the natural rate of increase rm = 0.6 female offspring for each cohort female per day, and the fnite rate of population increase λ = 1.85 individuals per female per day. Results of this research show highly significant differences for mortality in larval stage, survival adult percentage in the comparison of the two artifcial diets, indicating that using diet 1 is more effcient in the developmental process of all the life cycle stages of L. sericata. One of the possible causes of this difference, which had a remarkable impact at the population level, could be the limited quality of diet 2, i.e., the substances that composed this diet did not completely meet the nutritional requirements of the insects, requirements that were fulflled by diet 1, although in Cochliomyia hominivorax species diet 1 achieved effcient results when it was evaluated in the development of the biological cycle of this insect (Alvarez et al., 2005). Females of L. sericata that are anautogenous require a protein meal to initiate vitellogenesis (Hayes et al., 1999). To that end, the contribution of powdered liver, BHI and blood, which are protein sources in diet 1, were probably more optimal than the protein sources in diet 2. This contribution helped the formation of embryos with better potential abilities for adaptation and development (Barton-Browne, 2001). The immature forms resulting from these embryos were able to successfully continue through the different stages of the fy's biological cycle until reaching the adult stage. This situation was in contrast to that of the embryos initiated with the proteins provided by diet 2, which became less apt specimens. Likewise, when the larvae hatched, the protein substances and other nutritious sources available in diet 1 may have promoted the adaptation ability and the early development indicated, with the aforementioned result of lower mortality in the frst stages of the biological cycle as compared to the mortality rates of insects fed with diet 2. A theory of Davies & Hobson (1935) suggests that the most important factor, after nutrients, for survival in the frst stages of the life cycle is humidity. Given the different compositions of the two diets, it was possible that premature desiccation occurred with diet 2, taking into account that the environmental conditions under which the insects were maintained, for both immature and adult individuals, were the same for the two dietary groups. It is possible that lack of mineral salts in diet 2 contributed to greater water loss through evaporation. In general, the comparison of the vertical life tables for diets 1 and 2 indicate that the survival percentage was higher in the life table of the individuals fed on diet 1, while the mortality parameters (percentage, rate and force) had higher values in the life table for specimens from diet 2, mainly in the frst stages of the biological cycle. This confrms that the effciency of diet 1 contributed to quality and quantity of the nutrients needed for optimum development of the life cycle stages of L. sericata under laboratory conditions. As well, differences are evidenced in the survival curves, type IV corresponding to diet 1 and type III corresponding to diet 2 (Fig. 1), where a constant population of individuals dying in each time interval is clearly observed in the former and a high mortality rate in the early biological stages is observed in the latter. This confrms the previous reasoning on the effectiveness of diet 1. 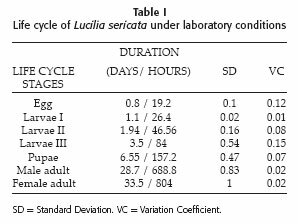 The average duration of the life cycle described in this research for L. sericata, from egg to pupae (13.89 days / 333.36 hours), is shorter in comparison to data provided by Usaquén & Camacho (2004) (26 days under natural environmental conditions), Nuorteva, (1977) (23-28 days under feld conditions), and Anderson, (2000) (32 days at 16ºC and 20 days at 21ºC), and similar to the information by Kamal, (1958) (12-15 days at 22ºC and 50% relative humidity) and Anderson, (2000) (14 days at 27ºC). Important differences were observed for the various biological stages because each stage presented a different period for development. According to Tachibana & Numata, (2001), the artifcial diet based on powdered milk can cause a lower duration of larval stages in comparison to the diets traditionally used, as often occurs with liver explanted from animals. However, this did not occur in the present work with diet 2, which included substances that resulted in longer periods of larval than of insects fed on diet 1. In addition to the effciency of dietary components, it is necessary to periodically provide the insects with fresh food in order to shorten larval stage development. As well, an appropriate substrate should be provided to the prepupae to accelerate growth and development (Tarone, 2006). These considerations were equally applied throughout this work with both diets. Nevertheless, there were evident differences that were more ideal for the insects fed with diet 1. In the analysis of reproductive and population parameters, the value of 586.84 was obtained for the net reproduction rate (Ro), showing that the population was in active growth as the result is higher than 1 (Cárdenas et al., 1999), while Abou-Zeid et al., (2003) showed a lower value of Ro=106.1 for L. cuprina, which they considered high. The fecundity results we obtained were similar to those of other works on blowfies (Hayes et al., 1999, Wall et al., 2001, Abou-Zeid et al., 2003). However, in these works each strain displayed its own characteristics in reproductive output. On the other hand, the mean generation time (Tc) was 17.81 days, indicating the time from the oviposition until female offspring were mature enough to oviposit their own eggs. This implies that every 17.81 days a new generation of L. sericata is present, while Abou-Zeid et al., (2003), recorded a slightly higher value of Tc=19.8 days for L. cuprina. The fnite rate of population increase (λ) was 1.85 days. This value indicates the maximum number of individuals added by a female to the population in a given time unit; this value was similar to that achieved by Abou-Zeid et al., (2003), who determined a value of λ=1.27 days for L. cuprina. With this same parameter, Silva et al. (2003) reported values of λ= -0.513 and -0.98 for L. eximia and C. macellaria, respectively. These values are lower than those recorded in the present work. The data suggest that the increase in the colony of L. sericata was constant during the generations analyzed in the laboratory. The fnite rate of population increase (λ) showed that the colony of L. sericata maintained its development in the laboratory with an estimated rate of one individual per female per day. The maximum intrinsic rate of natural increase rm = 0.6 indicates the female offspring per female in the cohort per day, while Abou-Zeid et al., (2003), recorded a value of rm = 0.236 for L. cuprina; these data confrm, according to Rabinovich, (1980), that the intrinsic rate of natural increase is genetically determined in a particular species. The parameters analyzed show that L. sericata has a higher replacement rate, a fnite rate of population increase higher than L. cuprina, L. eximia and C. macellaria, an intrinsic rate of natural increase higher than L. cuprina, and a mean generation time lower than L. cuprina. Survival curves of L. sericata obtained from both diets - The survival curve of L. sericata for diet 1, according to the classifcation of Rabinovich (1980), is a type IV curve because it represents a population in which there is a constant fraction of individuals dying in each age interval. The survival curve obtained with diet 2 is characterized as type III curve that corresponds to populations with very high mortality rates at the beginning of life (Fig. 1). Horizontal life table and determination of reproductive and population parameters - The following fecundity values were obtained: the average number of survivors of each stage for diet 1. 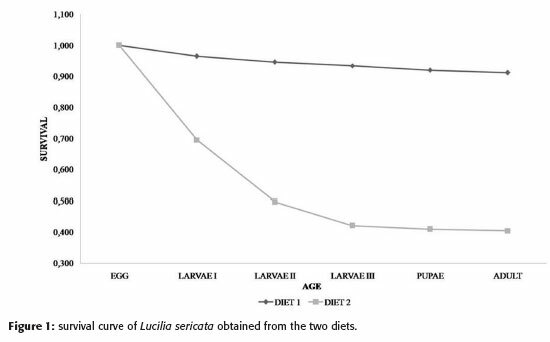 Thus, lower survival rates from egg to adult were observed for diet 2, showing signifcant differences from larva I to adult. In dx it can be observed that mortality has a similar behavior to column lx, showing a trend that is inversely proportional for the two columns; in qx, the average probability of death of the individuals for diet 1 is very low, while for diet 2 this probability is high in the stages from egg to larva II; in kx, the force of mortality is higher in diet 2, the differences between the two diets being higher in diet 2 in the stages from egg to larva II. In general, the survival of larval stages was of 96.5% ± 4.5 for diet 1 (3.5% mortality), while for diet 2 it was of 69.5%, ± 2.43 (30.5% mortality). Total survival from egg to adult stage was represented by a value of 91.2% ± 3.45 for diet 1 (8.8% mortality), while for diet 2 this parameter was of 40.5% ± 2.88 (59.5% mortality). In conclusion, the reproductive output and the population parameters of L. sericata had relatively high values with diet 1, which was reflected in the optimal biological development of the blowfy cycle through the seven consecutive generations analyzed under controlled laboratory conditions, making possible the maintenance of the population as a colonized strain that has lasted for more than two years. This knowledge could provide support to mass rearing of larvae under laboratory conditions, in order to be used for several basic and applied studies in biomedicine. We thank Estrella Cárdenas for invaluable collaboration in analyzing life tables. Financial support: Universidad del Rosario and Universidad de La Salle (UR-M257). Received: August 4, 2009. In revised form: November 30, 2009. Accepted: December 10, 2009.